As we outlined Monday, today looks to be a very active day for severe weather across northeast Colorado, including the greater Denver metro area. We are watching the setup closely for today, but things appear to indicate a pretty active afternoon of severe weather. The Storm Prediction Center has issued a 10% risk for tornadoes this afternoon across the greater Denver area and points northeast. This is the probability of a tornado within 25 miles of a given point within this 10% area. In addition to the tornado risk, these storms will be producing damaging hail and wind. The map below shows risk of hail >1" within 25 miles of a point, that's 30% for much of northeast Colorado and the urban corridor. The hatched area indicates areas where hail could be in excess of 2 inches in diameter. Latest high resolution models indicate storm initiation will start at a very similar time to yesterday, between 1 and 3pm. There may be several storms that kick of during the early afternoon, with another round during the mid to late afternoon depending on your locale. 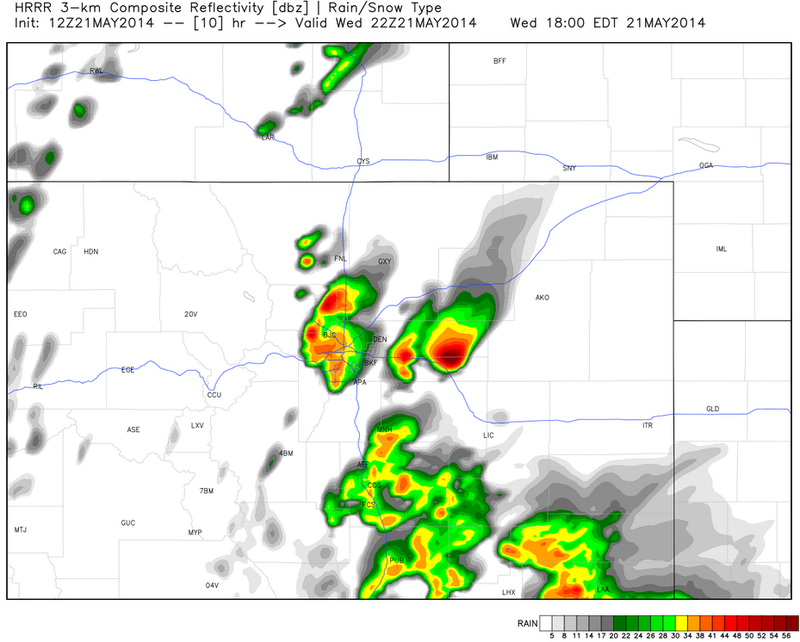 Here is a look at one of the model's simulated radar for 4pm this afternoon. Please pay attention to the weather throughout the day, and be aware of any weather advisories that may be issued this afternoon. We'll be tracking all the latest here at Weather5280, and have many updates throughout the afternoon on our Twitter feed.